You won't believe which parts of the Central Valley are still in a drought! Sacramento County is just one of several counties still "Abnormally Dry." 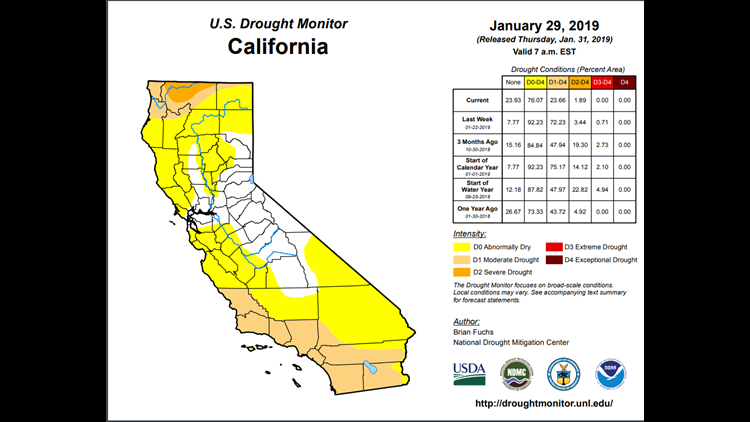 SACRAMENTO, Calif. — After days of rainfall, Sacramento County is one of several counties still considered "Abnormally Dry" by the U.S. Drought Monitor. In Northern California, the counties listed as "Abnormally Dry" include: Yolo, Sutter, Placer, Yuba, Sierra, and Plumas. The image above shows which parts of the state (shaded in yellow) are abnormally dry. Areas shaded in beige are considered to be in a "Moderate Drought." Those areas include Northern California, along with Southern California, which includes the Los Angeles and San Diego area. 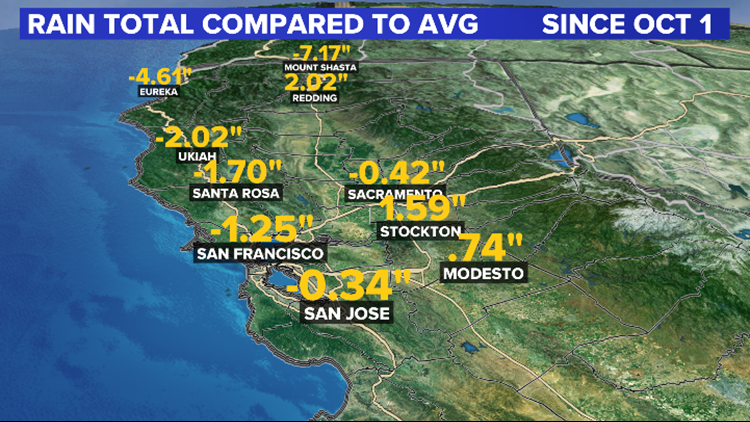 So how much rainfall have we picked up in Sacramento? Since Oct. 1, 2018, which marks the beginning of our water year, nearly 11 inches of rainfall has fallen at Sacramento Executive Airport. Keep in mind, that number does include the most recent storms from last weekend. Currently, as of today's date, we are slightly below average. Cities further south, such as Stockton and Modesto, are doing better. Both cities are above average for current rainfall compared to the average rainfall for today's date. As far as Sacramento's hopes for picking up some more rainfall? The long range forecast models are showing more rain may be on the way this weekend.